Anchored at this peaceful location. Site of an abandoned logging camp, a few crab pods and at least two humpback whales. This is the 3rd whale sighting today. Close by, a converted cannery, now a luxurious fishing resort offers fuel and water possibilities. 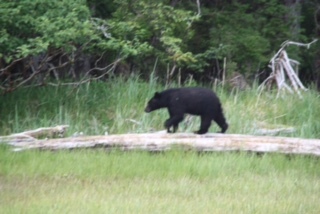 This port is also home to black bears that come down to a stream at low tide.